M/S LAILA DENIZ, a gulet specialized for the Mavi Yolculuk, as we say for Blue Cruise here in Turkish. 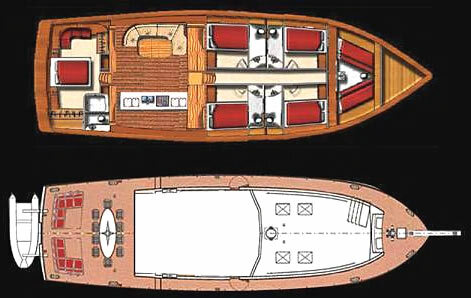 This charter yacht is one of our most popular good standard handcrafted wooden gulets. It appeals to groups of friends as well as families. Home port is Marmaris, she is a typical wooden ketch and available for weekly or longer cruising periods. 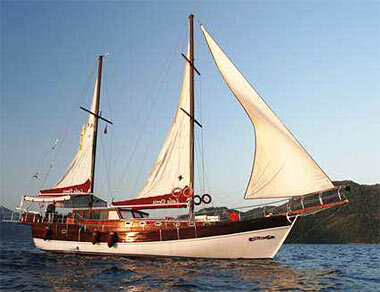 This Gulet easily accomodates up to 10 guests in one master and 4 double cabins. Each of them with private bathroom and air conditioned cabins. Please check the below technical datas. The fully equipped galley is complete with fridge and freezer. On deck at the stern is a bar area and a large dining table. The gullet M/S LAILA DENIZ will visit magical ancient sites and coves and you will get to know the most popular bathing resorts and harbour cities. If you want, you can wander through famous archeological sites or use snorkeling equipment to discover sunken harbour moles. is considered to be among the finest in the world. On board the M/S LAILA DENIZ you will find the finest Turkish dishes, prepared using the freshest vegetables, fish and meats. Our cook is an expert in his field. He will pamper you with three meals a day: breakfast, lunch and a three-course dinner in the evening. If you have any special dietary requirements (if there are certain foods you dislike or mustn't eat), simply let him know. He will be able to prepare dishes to suit your exact taste. Meals are mailny served on deck under the awning which protects you from the sun. In cooler months, our guests dine in the deck salon. Your meals on board: You will have fullboard (3 meals + teatime) price € 32,- p/person per day. (the food for the crew is included in this price as well). Soft Drinks and alcoholic drinks are extra, you may send us a list and we can buy them at supermarket prices and you just pay us the bill plus a service-extra for the crew of only 10%: We think that's a fair offer and all previous guests did appreciate that very much. There is nearly none of the gullet charter-companies who tells you the truth about the use of air-conditition on Gulets. Yes, M/S LAILA DENIZ has AC and you switch it on indivually. But on a boat the AC can only run when the generator is on, or in a harbor when connectet to 220 Volt. Mainly you are in anchorbays, often next to a neighbor, who doesn't like the noise of your generator and you wouldn't like it either during the night for example. Spacious sun deck area with mattresses and cushions, sun awning, cushioned front deck with a large table, deck chairs, spacious saloon with bar and dining table, canoe, snorkelling and fishing equipments. And of course, like all our boats, the M/S LAILA DENIZ meets international safety regulations including life jackets, fire extinguishers and alarms.